JGFA offers 9 types of membership (Support, Regular Individual, Voting Regular Individual, Voting Regular Club, Family, Junior, Corporate, Life and Academy). A lot of anglers who don’t belong to any clubs usually opt for Regular Individual membership. Annual due : 1,000 yen The lowest-cost solution to JGFA membership. Record application is limited to all-tackle category and you will have to upgrade to Regular membership for 6,000 yen. Optional IGFA Registration : 5,000 yen per person The standard membership, with all benefits except for the voting rights at General Assembly. 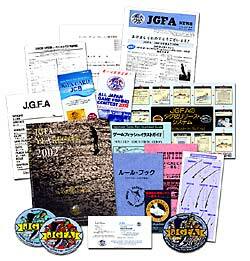 Optional IGFA Registration : 5,000 yen per person Directors, ambassadors and council members requires this category. All membership benefits are granted including the voting rights. Optional IGFA Registration : 5,000 yen per person If you can form a group of at least 5 people, you can register as a JGFA Club. The leader is given the voting rights at General Assembly, and the club annual due includes membership for the leader. Optional IGFA Registration : 5,000 yen per person The family living together can apply for this collective membership, of which privileges are virtually identical to Regular Individual but for a much lower fee. Optional IGFA Registration : 2,500 yen per person Anglers of 16 years old and younger can join JGFA for a much discounted fee. Annual due : 100,000 yen for 3 people Under this membership three people in a single corporation can register at both JGFA and IGFA. Direct mail service to our members can be provided at office cost. Exposures are given in multiple media that JGFA has. Lifetime due : 500,000 yen It is a Voting Regular Individual member that is registered for life, and it includes lifetime membership at IGFA. Names are respectfully exposed in our yearbook. Annual due : 10,000 yen It is employed for student, and the school pays the membership. In case of a record application, separate fee applies (3,000 yen per record), and the schooling certificate is required.